(and what Sensenstahl said, too). Cool! Great music and sync. This is awesome! Excellent transitions and great effects. Nice stuff. Clean and nice. I wish I had an analog scope. DSOs just aren't there yet. Great! Love the sync effect, too. Wow, one of the best wild I've seen in a while. The transitions are almost perfect! Way to go Luis! Nice job with the sync. i have been working with scopes for years and this is definately the best thing ive seen a scope do. great work guys. perfect! was blown away with great transitions and music sync. Great concept and lovely visuals. 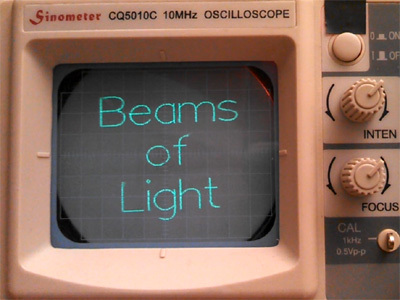 An X-Y mode oscilloscope simulator which runs under Windows along with its Python source was included. What tFT and wullon said. rulez added on the 2014-07-01 00:35:24 by ɧ4ɾɗվ. Smooth with real nice transitions! Far from my favorite scope demo but nice nonetheless. page created in 0.025603 seconds with 15 queries.